Nearly 25 young church planting leaders in the Fellowship of Grace Brethren Churches gathered in late May in Peninsula, Ohio. Led by Tony Web (VisionOhio), Nathan Wells (SeedNet), and Joe Caruso (Grace Church, Akron, Ohio), the group visited different kinds of church plants from North Canton to Akron to Ashland and Mansfield to Columbus. Coming from as far away as Florida and Alaska, the men found camaraderie in being around those who are like-minded. They learned, laughed, and prayed together. 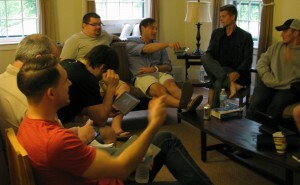 The event was sponsored by the Church Planting Team of the Enduring Visionary Leadership Community.